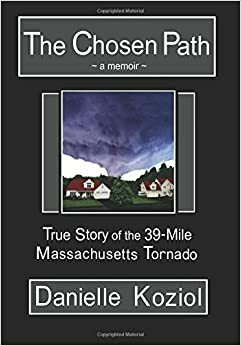 The Chosen Path, is a true account by author Danielle Koziol, of the tornado that did a great deal of damage in the town I was raised in, Monson Massachusetts, along its 39 mile path of destruction. Not only did Danielle write this book, she lived it, as she herself is a resident of Monson. As you know this blog is not only about my journey to becoming a published author, it is also about inspiring and motivating in an effort to help one another. So lets help Danielle, and spread the word about her new book through our social media channels. As always my friends thank you for taking the time to stop by. This entry was posted in Today’s thoughts and tagged authors, bibliophile, blog, books, creative writing, inspiration, motivation, Publishing, The Big Lead, writers, writing. Bookmark the permalink.